Tone up! Firm up! Get healthy and contribute to the scientific enterprise! Yes, here’s your exclusive opportunity to join the Phactor’s field work out crew and get the work out of your life while pushing back the frontiers of knowledge. Tired of treadmills and stair-masters that quite frankly don’t get you anywhere? 30 mins of sweating and you’re still exactly where you started, well exercised, but no accomplishments whatsoever! And jogging! Talk about mind numbing! My total field work out will fix all that! You can lug materials and supplies over hill and dale. You can trek back and forth from vehicle to study site until you drop. And on top of all of that my patented field work out will provide more deep knee bends than any comparable field research program. BE READY FOR THE WORKOUT OF YOUR LIFE! 20 year old biology majors wilt, graduate students whine, and field work out has just gotten started! Wait until you get peppered mercilessly with ecological and botanical questions! Just wait until the data analysis begins! Just wait until the Phactor discovers you lost a critical specimen somewhere out on the endless prairie! Be the first to sign up for health and science! DO IT NOW! The road to health and science travels through my study site, and the Phactor has a new research director’s chair he wants to try out. Today is a gray day following two days of rain that have done their best to wash away the fall colors, and it is on such days, especially after spending those days grading exams, that the Phactor is most aware that he is in the fall of his career and life. At such times, thoughts of retirement arise, inevitably and sadly so because my love and enjoyment of teaching botany have not diminished, and my personal interactions with students are still rewarding, as are my scholarly endeavors in spite of their slow pace to completions, but when you realize how little impact your love of learning, your accumulated knowledge and experiences, and your deep insights into certain botanical concepts and problems has had on so many of your charges, you become a bit discouraged. At such times you cling to those who are successes like a drowning person clings to a life ring because you wonder how many seats would be empty if you guarantied the uninterested-in-learning a “C” if they simply left you and the rest of the class alone for the rest of the semester. Of course the really uninterested seldom bother us with their presence anyways, so perhaps it would not be as bad as imagined on a cold, gray day when fading leaves carpet the ground. On my homeward trek, somewhat earlier than usual, this rather healthy specimen of a vine caught my attention, adorned as it was in fruit. So before it pulls down this utility pole, can anyone identify this utilitarian plant? While you're having a go at this, the Phactor will sit back and enjoy a cold one. Oh yes, it's not a native, but was named formerly like it was one. Every now and then, just for a change of pace, the Phactor tries to dispense with some practical gardening advice. Since this is an excellent season to plant new trees and shrubs, here is some important advice for novice gardeners out there. Whenever you buy nursery stock that has been potted, placed into one of those big plastic pots, you must take the time and effort to tease out the root ball, even if it means breaking some of the roots in the process. The longer the plant has been in the pot the worse the problem. My tool of choice is an old, dull three pronged soil scratcher; it works fairly well pulling the roots out of that compressed cylinder so that you may spread the roots out as you plant it. If you don't do this, there is a good chance that in 2 to 3 years, you will wonder why your plant is not growing very well, or why it died, or why it looks so weak and puny, and when you pull on the base of the tree or shrub, up comes the cylindrical root ball the same shape and size as when you put it in the ground. You might as well have planted it pot and all. The Phactor learned this the hard way many years ago after exhuming several failures. So get out there, take advantage of the end of the season sales at nurseries, and tease out those roots before you plant. Balled and burlaped trees generally do not suffer from this problem. Oh, one more bit of advice, find someone to dig the holes while you tease the roots and lecture them on this advice. More good news! You know yet another scientific name of a plant: Chrysanthemum. But, it isn't the plant you think it is. Those darned taxonomists figured out that chrysanthemums (chryos- Greek for gold; anthemon - Greek for flower) did not form a natural group and various species have been segregated into about 10 different genera. The familiar "florists' chrysanthemums" pictured here and so popular this time of year are now in the genus Dendranthema (dendro = woody, a reference to their woody annual stems). Like many other people, the Phactor learned to call the Shasta or ox-eye daisy Chrysanthemum lecanthemum, which is kind of fun to say, except it meant "goldflower-whiteflower". Leucanthemum (leuco = white) is their new genus. Other former chrysanthemums are the pyrethrum daisies (feverfew - long known as a remedy for fevers, and as a source of the insecticide of the same name) are now placed in Tanacetum. And what of the real chrysanthemums? Of the 300-400 species that used to be in this genus, now there are two, both annuals of the Mediterranean region. The Great Pumpkin Patch cont. Who could resist this picture? Yes, that's the Phactor admiring a rainbow of squashes, another demonstration of the genetic variety of Curcurbita. This picture is compliments of lovely friend Carol, so it wasn't available for yesterday's blog post. Enjoy! 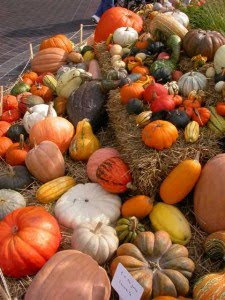 Mac Condill is out of his gourd, just plain nuts-crazy, in a good way, about pumpkins and squashes! A visit to this Lincolnland icon just outside the mighty metropolis of Arthur (mind the horses & buggies) would convince anyone about his condition. 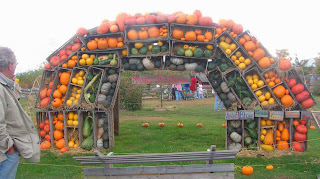 The Great Pumpkin Patch is a paradise of cucurbits, an ode to squashes, pumpkins, and gourds, a symphony of pepos. This fellow is an alumnus of my public institution of higher learning, and this probably figures into his deranged state of mind, but the Phactor assures you the only physical danger is having a squash dropped on your foot (the largest on display topped 900 lbs!). However once you behold the over 400 varieties of squashes and pumpkins being raised and sold as fruit or seed here it might result in your catching gourd fever. Pumpkins and squashes are all classified in just a few (3 or 4) species of Cucurbita and they are all trace their ancestry to Central America, but as they have moved around the world and interacted with people, their genetic diversity has become manifest in all these varieties. So which variety is the best for flavoring pumpkin ice cream? Believe me, Mac knows. The budgetary crisis here in Lincolnland has led to many cuts in state programs including MAP grants for higher education. Now budgetary crisises are nothing new here in Lincolnland, one emerges annually, as our representative jocks play political football with money. 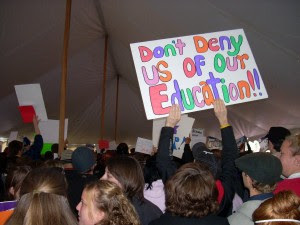 And higher education certainly doesn't expect any favors, especially since out representatives figured out that they could gradually withdraw support from the state supported colleges and then dun them for letting tuition rise faster than costs. So naturally those colleges & universities must be wasting money on stuff like faculty salaries. During the Phactor's 30+ year career, state support has dropped from 66% to less than 25% of our budget. But this year the need-based MAP grants got cut, and as a result over 130,000 students wondered about how they were going to pay for the rising tuition brought about by diminished state support. And while our political jocks complain about job losses to China, China is putting more and more government support into higher education. They must know something our "leaders" don't. So while not worried about my own livelihood per se, the Phactor was pleased to see that MAP was restored, albeit in that great Lincolnland tradition without any funding, because as this student's sign demonstrates, they needs of their education. Ah, fall comes to colorful Lincolnland! The beautiful browns of soybeans and maize ready to harvest, the gray overcast skies, the rain drops on your windows and head, drab yellows of senescing leaves, and maybe the worst October weather ever! The first two weeks of October have some of the most reliably good weather here in Lincolnland. This information came from Peter Raven, Director of the Missouri Botanical Garden, who had his staff conduct a survey of over 150 years of weather records. Peter used this data to schedule the Garden's annual systematic symposium because it also coincided with a time period when the gardens look very good. Oh, but this year the weather gods are getting even by teaching us about the law of averages. And of course, while all of the Phactor's students know that "it never rains on a field trip", it can often rain on your field research. So we are struggling to collect the specimens used for the data of an experimental prairie research project, and the only thing it hasn't done so far is snow. Hmm, yes, we got snowed on last year, but that was way into November, and the student, whose research project required this late season foray into the field, dutifully noted, "well, it didn't rain". So well put. Wow! The Phactor got nominated for a diversity award at our great public university! What an honor! Except the award committee informed me that my nomination was considered invalid! Having spent the greater part of my adult life teaching biological and botanical diversity, you may wonder in what respect was my involvement with diversity invalid? Well, people, it's because the Phactor is not about people. Yes, rather than considering diversity in some meaningful sense, diversity at a university only refers to human diversity: different sexes (covered), different cultures (covered), different varieties (covered), different countries of origin (Different geographic origins covered, but what do organisms care about political boundaries?). And this then is symptomatic of the whole problem of our egocentric approach to knowledge. About 5% of our faculty and about 5% of a college degree are about life and the universe; all the rest is about humans and human artifacts. Does that seem a fair balance? US, US, US, US, US, US, US, US, US, US, US, US, US, US, US, US, US, US, US, and everything else. A historian complains that not enough is required to teach "ancient" history. Ancient! Plant diversity covers 3.8 billion years of history! In comparison, human history is like reading yesterday's newspaper! Even biology suffers from a human biomedical bias that does its darnedest to reduce diversity. Why some of my colleagues do not even want to include those organisms, plants all, that prevent us from being naked, miserable, and hungry. The Phactor needs no stinking diversity award of that type! 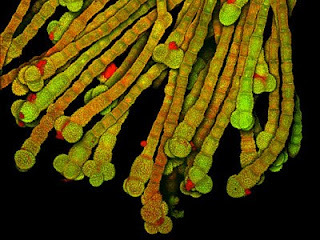 Each year Nikon sponsors a photo contest of small subj ects, many of which, but not all, are biological. Usually a number of the subjects are botanical too, although perhaps fewer this year than in the past, and of those, too many, including the winning image, are of one plant species, Arabidopsis thaliana, the botanical equivalent of a lab rat, whose common name is, appropriately enough, the mouse-ear cress. Here's another botanical image taken by Dr. Shirley Owens of Michigan State University. Can you guess what these are? Here's your hint, but it won't help: they are magnified 450X and are found on the black-eyed susan vine. Growing up in the 50s and 60s meant that there was really only one professional sport, baseball. Oh, every now and again you would go see a hockey game, but as a kid we were hardly ever separated from our glove and bat. And now my thoughts on baseball are simple: couldn't care less! Major league baseball is dragging itself into another October and does it seem to anyone else that they're all just bloody tired of playing the game? Watching Fall baseball is like watching a tired sit-com whose writers ran out of ideas about 2 seasons ago! In thinking back the Phactor remembers the precise moment when my interest in baseball began to wane: when the Phillies acquired Pete Rose as a free agent from the Cincinnati Reds. All Reds fans hated the Phillies, and we loved Pete Rose. The conflict in loyalty was too much to deal with. The result is quite simple, this former fan no longer knows or cares what happens in baseball. October is now for gardening. OK plant lovers, the latest Berry-go-round (#20) is posted over at Further Thoughts. Click on over and see what phyto-goodies have been rounded up!